The Fine Arts Society of Milton (FASM) has been running a very successful Milton Area Studio Tour since 1998. As a volunteer-run, not-for-profit group, we rely on our members to contribute their time and talents for all our activities. Our Tour area covers most of North Halton and we welcome guest artists from the area and beyond as long as they are FASM members. The Milton Area Annual Studio Tour is always held on the weekend before Thanksgiving on the Saturday and Sunday from 10 AM to 5 PM. Visitors on the Tour follow a self-guided brochure and map, with the aid of signs posted along the way.  Working Studios, which can be free standing or in homes but are set up with the tools, finished works, works in progress or display space where the artist normally creates. They are in rural and urban locations.  Solo Locations, with one artist or a couple in their private home, both rural and urban. An area of the home is set up with displays of work and materials used and, where appropriate, a demonstration area.  Guest Artists are invited to locate themselves in Solo Locations. There is usually one guest in a Solo Location.  Group Locations with 3 or more artists have been in set up private homes, community centres, and galleries. They are in rural and urban locations. For any Commercial gallery locations, you will see only works by artists on the Tour on display. 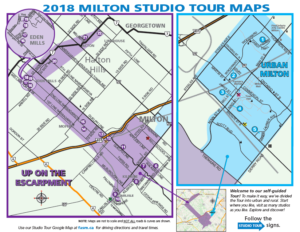 If you are an artist wishing to enter the Milton Studio Tour, click here to find the guidelines and applications. You must be a FASM member to qualify for the Studio Tour. Click here to find the membership application. Come to our Studio Tour and see the variety and quality of the work yourself.